Holy Happy Hour Minyan - Monthly Musical Friday Night Service! 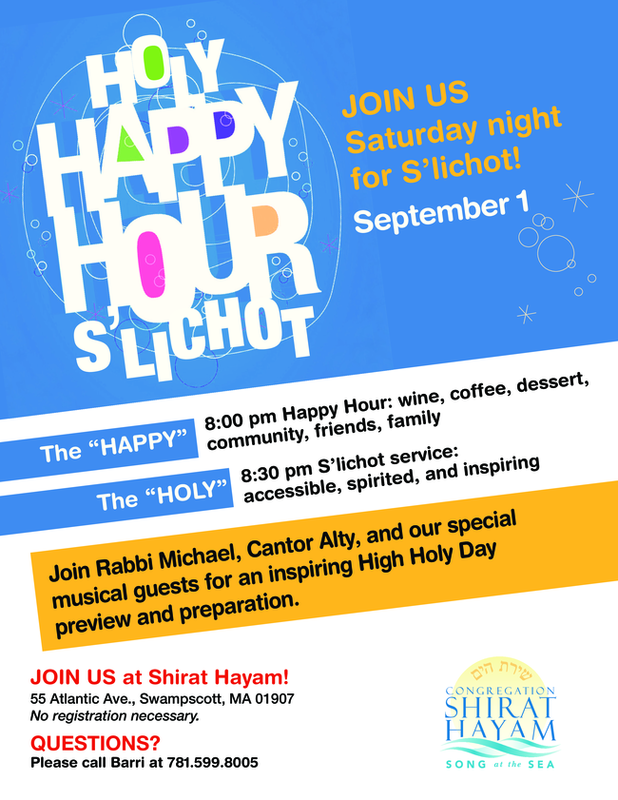 Read more about Holy Happy Hour Minyan - Monthly Musical Friday Night Service! That 70s Purim Spiel and Megillah Reading! Please RSVP and let us know you're coming by emailing [email protected]! Read more about That 70s Purim Spiel and Megillah Reading! Shabbat Synaplex - Celebrating Director of Congregational Life Marla Gay! Please join our clergy, lay leaders, professional staff, and Marla's family for Shabbat Synaplex on Saturday, October 29, 9 am. Please come to say "Todah Rabah!" - "Thank You!" - to Marla, whose presence here throughout the years has given both face and heart to the words "Radical Hospitality". Read more about Shabbat Synaplex - Celebrating Director of Congregational Life Marla Gay! Erev Simchat Torah at CSH! Family supper at 5:15 pm with mac and cheese, salad bar, and sundaes! Consecration at 6 pm. Join us as we celebrate Torah with our CSH families! Saying Good-Bye to Our Snowbirds for the Winter! Please note: Shabbat Dinner planned for this evening following Services has been cancelled! Selichot Olam - Register Now! Selichot Olam - Preparing for the High Holy Days! Click here to register and to learn more! Read more about Selichot Olam - Register Now! Kabbalat Shabbat Bring Your Own Picnic to the Beach! Read more about Kabbalat Shabbat Bring Your Own Picnic to the Beach! Bring a friend - everyone is welcome.